32 Foot Cabo Express "Bill Collector"
The Bill Collector is a beautiful 2005 Cabo Express yacht, with a top speed of 32 knots. 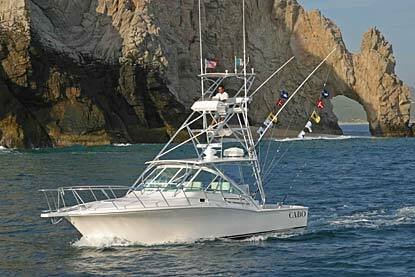 This vessel is considered the ideal for sportfishing and has the perfect layout for a day on the water. You will be hard-pressed to find a cleaner boat than this one in the harbor. The crew keeps her in impeccable condition. The cabin is fully air-conditioned and has an L-shaped dinette with seating for six. The kitchenette has a refrigerator, microwave and stove. The bathroom is of a good size and very clean. There�s satellite radio to listen to your favorite music or you can plug in your iPod. The open style of this vessel allows everyone to participate in the action whilst at the same time there�s plenty of shade for up to six guests, with comfortable seats. The cockpit is well designed, with a professional fighting chair, molded-in refrigerated fish box to keep your catch, and freezer aboard. Bill Collector has a Furuno radar with a 90-mile range, GPS and Fish Finder. Fishing equipment is two-speed Shimano and ranges from 16 to 50 lbs. Both heavy and light tackle are available upon request. Captain Julio Gonzalez speaks English and is a Cabo native with a gentle style. He has been fishing this area for 15 years and loves to fish Marlin as well as other species. His largest fish to date is a 950-lb. Black Marlin caught on the mainland. Julio and his deckhand go out of their way to make you feel welcome, sometimes preparing fresh sashimi and ceviche aboard. Equipment by Shimano, ranging from 16-50 lbs.